Wild Radish (Raphanus raphanistrum) is a dicot weed in the Brassicaceae family. In Brazil this weed first evolved resistance to Group B/2 herbicides in 2013 and infests Spring Barley, and Wheat. Group B/2 herbicides are known as ALS inhibitors (Inhibition of acetolactate synthase ALS (acetohydroxyacid synthase AHAS)). Research has shown that these particular biotypes are resistant to chlorimuron-ethyl, cloransulam-methyl, imazapic, imazapyr, iodosulfuron-methyl-sodium, metsulfuron-methyl, and sulfometuron-methyl and they may be cross-resistant to other Group B/2 herbicides. COSTA, L.O. and RIZZARDI, M.A. The ALS-inhibiting herbicides, especially metsulfuron-methyl, are widely used for weed control, mainly wheat and barley in southern Brazil. 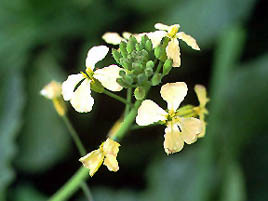 Raphanus raphanistrum is a major weed of winter crops. However, in recent years, R. raphanistrum, after being treated with metsulfuron, has shown no symptoms of toxicity, possibly due to herbicide resistance. Aiming to evaluate the existence of R. raphanistrum biotypes resistant to metsulfuron, an experiment was conducted in a greenhouse, in a completely randomized design with four replications. The plots consisted of pots with six plants. The treatments consisted of the interaction of resistant R. raphanistrum (biotype R) and susceptible R. raphanistrum (biotypes S) with ten doses of the herbicide (0.0; 0.6; 1.2; 2.4; 4.8; 9.6; 19.2; 38.4; 76.8 and 153.6 g i.a. ha-1). The application of the test herbicides occurred when the crop was at the stage of 3 to 4 true leaves. The variables analyzed were control and dry matter accumulation. Statistical analysis of dose-response curves was performed by non linear regression. Biotype S was susceptible to the herbicide even at doses below the recommended. Biotype R was insensitive to the herbicide obtaining values of resistance factor (F) higher than 85. The dose-response curve confirmed the existence of R. raphanistrum biotypes with high level of resistance to metsulfuron-methyl. Greenhouse trials comparing a known susceptible Wild Radish biotype with this Wild Radish biotype have been used to confirm resistance. For further information on the tests conducted please contact the local weed scientists that provided this information. There is no record of differences in fitness or competitiveness of these resistant biotypes when compared to that of normal susceptible biotypes. If you have any information pertaining to the fitness of Group B/2 resistant Wild Radish from Brazil please update the database. The Herbicide Resistance Action Committee, The Weed Science Society of America, and weed scientists in Brazil have been instrumental in providing you this information. Particular thanks is given to LEANDRO OLIVEIRA DA COSTA for providing detailed information. Yu, Q. ; Han, H. ; Li, M. ; Purba, E. ; Walsh, M. J. ; Powles, S. B.. 2012. Resistance evaluation for herbicide resistance-endowing acetolactate synthase (ALS) gene mutations using Raphanus raphanistrum populations homozygous for specific ALS mutations. Weed Research (Oxford) 52 : 178 - 186. Acetolactate synthase (ALS)-inhibiting herbicide resistance is common in Raphanus raphanistrum (wild radish) populations across the Western Australian (WA) grain belt. This study investigates the molecular and biochemical basis of ALS herbicide resistance in five R. raphanistrum populations. Five known ALS herbicide resistance-endowing mutations (Pro-197-Ala, Pro-197-Thr, Pro-197-Ser, Asp-376-Glu and Trp-574-Leu) were identified, and their resistance spectrum to ALS-inhibiting herbicides was determined using purified populations individually homozygous for each mutation (except for Pro-197-Ala). Plants homozygous for ALS mutations at Pro-197 were found to be cross-resistant to ALS-inhibiting sulfonylurea (SU) and triazolopyrimidine (TP) herbicides, while plants homozygous for Trp-574-Leu were resistant to SU, TP and imidazolinone (IMI) ALS herbicide classes. The Asp-376-Glu mutation is reported here for the first time in R. raphanistrum populations and characterised at both the whole-plant and enzyme level. Plants homozygous for Asp-376-Glu were highly resistant to SU and TP herbicides, based on LD50 R/S ratios (>130 and 128 respectively) and I50 R/S ratios (170 and >110 respectively). In contrast, these plants were moderately resistant to the IMI imazamox (LD50 R/S ratio of 8, I50 R/S ratio of 3) and imazethapyr (I50 R/S ratio of 8) and susceptible to imazapyr (I50 R/S ratio of 0.76). A novel observation in this study is that resistance of homozygous Glu-376 plants is associated with a remarkable growth reduction in the presence of the ALS herbicides tested, making early resistance diagnosis and management difficult..